Click an artist’s name to read the biography. (Infra) Structure is an exhibition of artwork in the Lannan Collection examining the notion of structure. 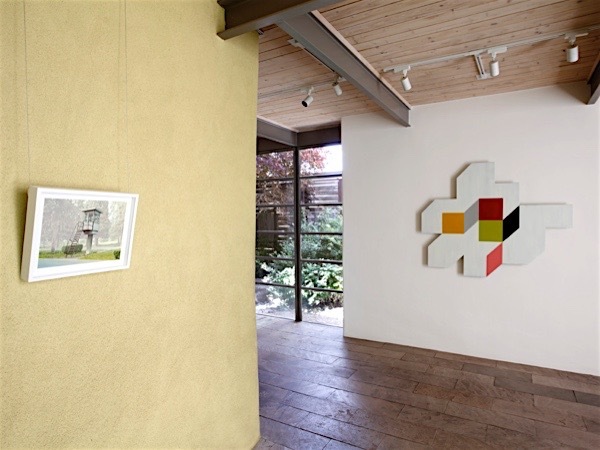 Photographs of buildings, train tracks, and internet cables are presented with architectural renderings, dreamed-up gardens, and a model of a make-believe house. Images of monumental land art projects and a drawing of a massive sculpture face a city in miniature and a tabletop askew. Looking at the ways in which artists take structural foundations and record, rearrange, or imagine them anew, (Infra) Structure reminds us of the depth of human ingenuity. Click here to jump down to the Installation View photos. 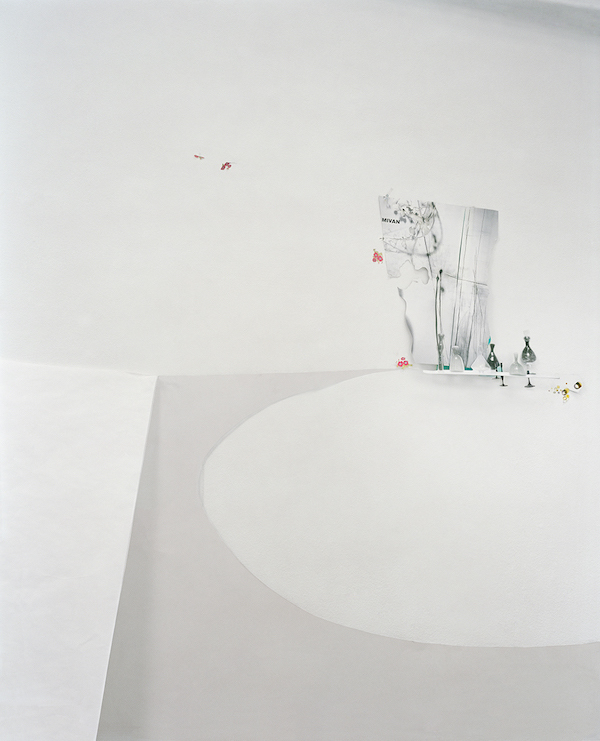 Image: Laura Letinsky, Untitled #55 (vases), 2014, archival pigment print, 50 x 40 inches, edition 2 of 9, Collection Lannan Foundation. 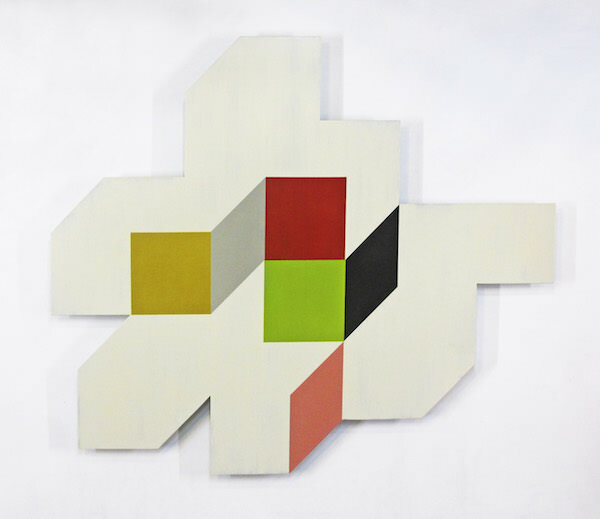 Image: Pard Morrison, Invisible Hands, 2014, fired pigment on aluminum, 15 ½ x 24 x 2 ¼ inches, Collection Lannan Foundation. 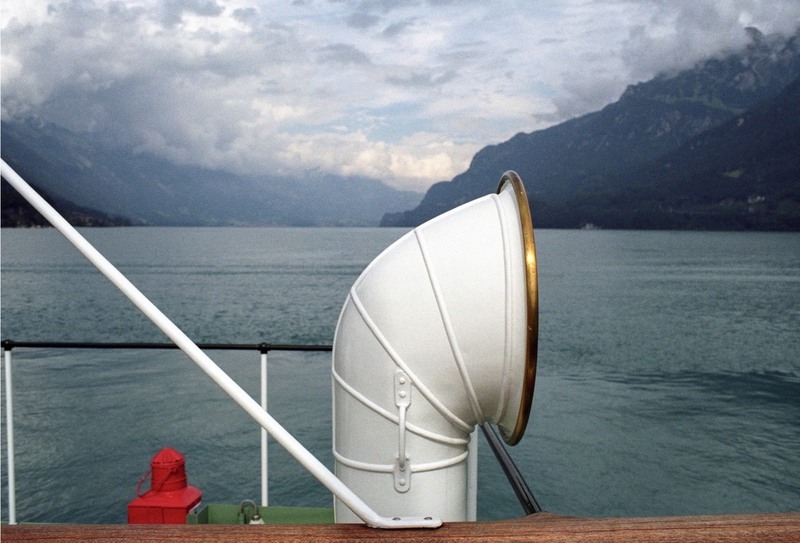 Image: Josef Schulz, unoe 03, 2009, archival pigment print, 11 ¾ x 15 inches, Collection Lannan Foundation. Image: Olivo Barbieri, The Waterfall Project, Niagara Falls, Canada/USA, 2007, inkjet print on archival paper, 14 x 17 inches, Collection Lannan Foundation. 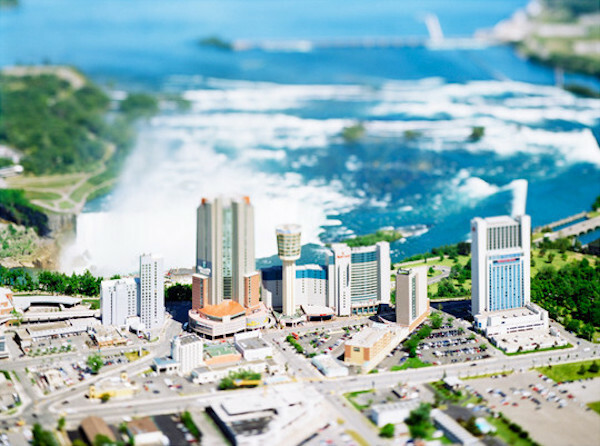 Olivo Barbieri makes photographs using a tilt-shift lens, portraying cities such as New York, Las Vegas, Shanghai, and Rome in miniature. By simulating a shallow depth of field, this technique gradually blurs the top and bottom or left and right edges of the image, creating a radiating center focus. The resulting urban portraits render their subjects in miniature, making some of the world’s biggest cities look like models. Barbieri’s photographs are taken from a helicopter, giving him a rare bird’s-eye view, like Gulliver observing the Lilliputians. 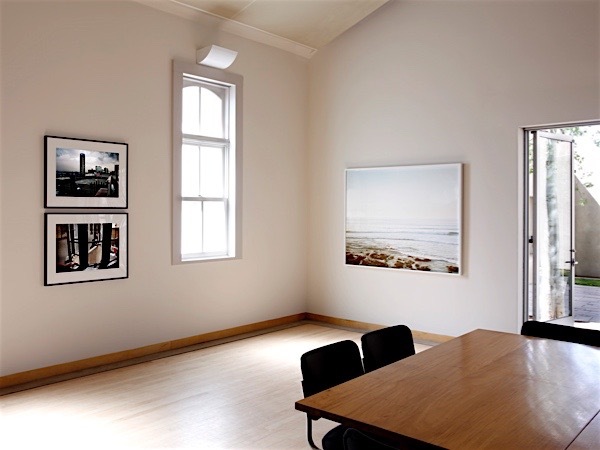 The artist works in series and has created groups of work based on cities, beaches, mountains, and waterfalls. In The Waterfall Project, Barbieri traveled to some of the world’s most awe-inspiring falls, such as Victoria (Zambia/Zimbabwe), Iguazu (Argentina/Brazil), and Khone Papeng (Laos/Cambodia). In the case of Niagara Falls (Canada/USA), through Barbieri’s lens, one of North America’s most daunting and awe-inspiring natural wonders becomes charming and amusement park–like. Image: Aerial survey photograph of Michael Heizer’s The City (Aerial Photograph of “The City Complex” Showing Land Owned by Triple Aught), 2008, C-print, 24 x 37 inches each, Collection Lannan Foundation. Michael Heizer said, “I think earth is the material with the most potential because it is the original source material.” As a leading artist in the land art movement, Heizer has been intervening in the landscape since the late 1960s. 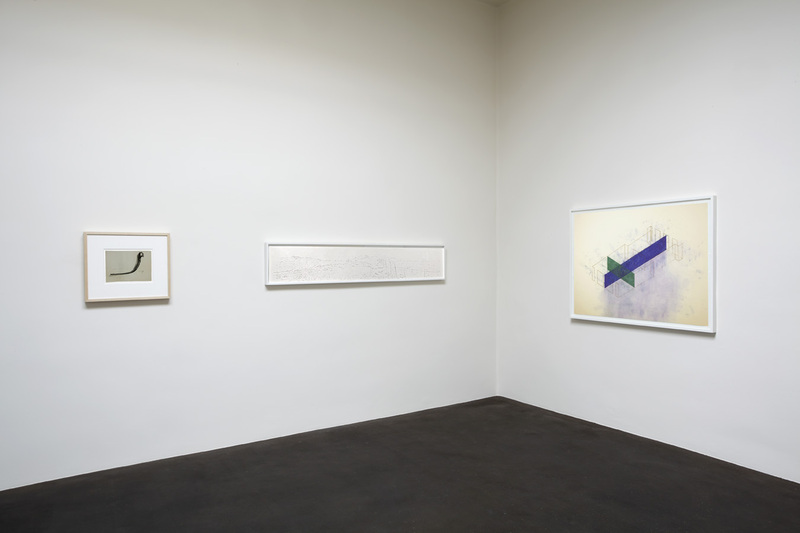 Influenced by his anthropologist father and geologist grandfather, Heizer had his first solo exhibition at the Galerie Heiner Freidrich in Germany in 1969. For that show he excavated 1,000 tons of earth in a conical shape to form the Munich Depression. In 1970 Heizer completed Double Negative, consisting of two trenches created by displacing 240,000 tons of rock at Mormon Mesa, Nevada. Of the project he said, “There is nothing there, yet it is still a sculpture.” In 1972 Heizer began construction for another enormous work, City, a lifelong project in the desert of Lincoln County, Nevada. As Heizer said of City, “I’m building this work for later. I’m interested in making a work of art that will represent all the civilization to this point.” Covering territory approximately a mile and a quarter long by more than three-quarters of a mile wide, akin to the size of the National Mall in Washington, DC, Heizer’s sculpture takes inspiration from the ancient city of Chichen Itza. This aerial photograph of the project illustrates its massive size and harmony with the landscape. Image: John Cliett, Field before the Storm, Walter de Maria’s Lightning Field, 1977, chromogenic print, 25 x 44 inches, Collection Lannan Foundation. 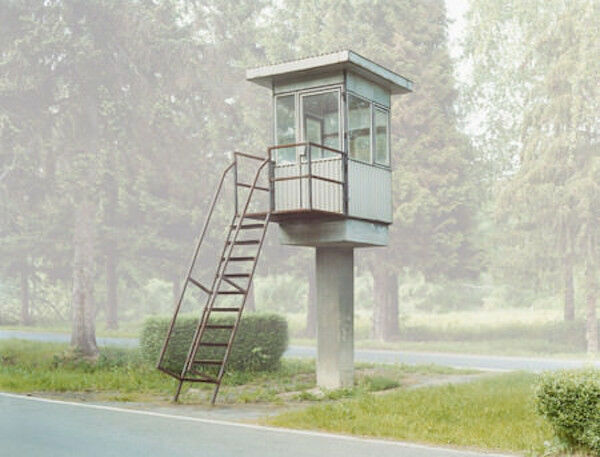 Image: Christina Seely, Lux: Metropolis 35° 10’N 136° 50’E (Nagoya), 2005–2008, digital C-print, 14 x 11 inches, Collection Lannan Foundation. 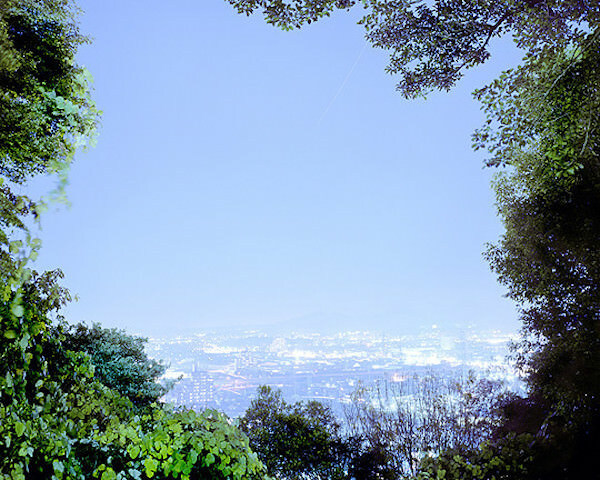 Rather than documenting the light created by the sun and lightning, Christina Seely‘s project Lux illuminates the connection between artificial light and beauty and how it is manifested on earth’s surface. Using NASA maps, Seely identified 45 of the most brightly lit cities in the United States, Europe, China, and Japan and then visited them to make her own recording of their particular glow. Named after the unit for measuring illumination, Lux very clearly distinguishes the hot spots of economically and politically powerful regions on the planet, whose glare is staggering in comparison to countries and continents that lie in almost total darkness. While Seely does identify cities and she titles her works based on longitudinal and latitudinal degrees, each title also includes the term metropolis, establishing the body of work as being less about individual countries and more about a region’s global impact on the planet’s shared ecology and limited resources. 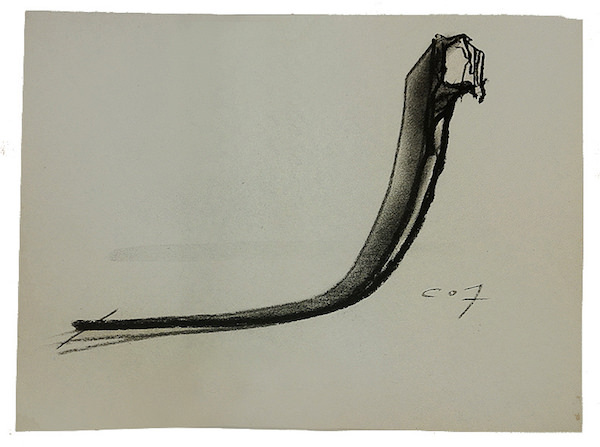 Image: Christine Corday, KNOUN d2, 2007, charcoal on newsprint, 9 x 12 inches, Collection Lannan Foundation. 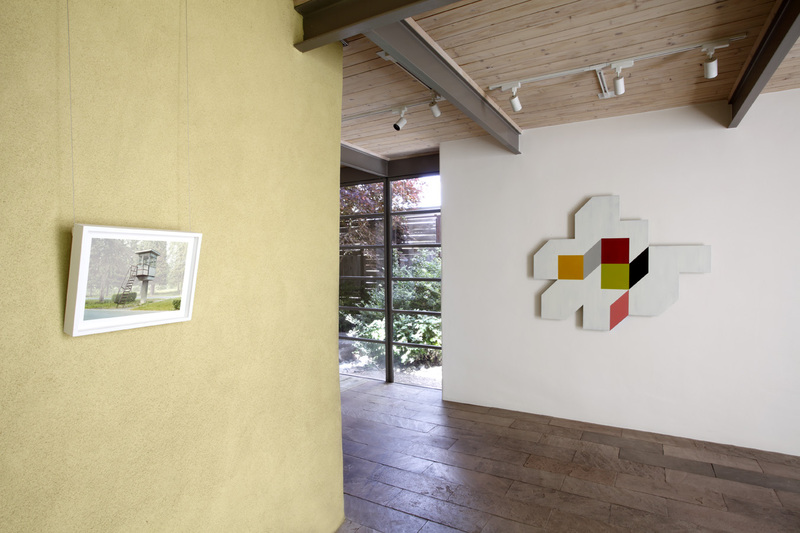 Image: Joanne Lefrak, Trinity Site, 2013, scratched Plexiglas and shadow, 14 x 74 inches, Collection Lannan Foundation. Joanne Lefrak makes drawings of places that are deeply embedded with history and meaning, such as spiritual and healing sites, pilgrimage sites, and ghost towns. No writing instruments or paper are involved in her drawings. 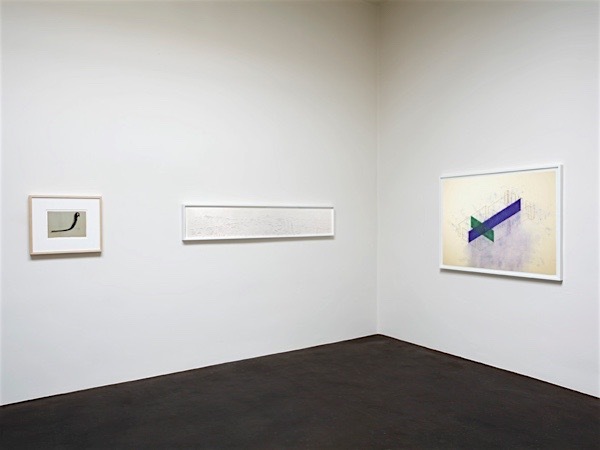 Rather Lefrak scratches lines into Plexiglas, making an image apparent as a shadow on the surface behind it. 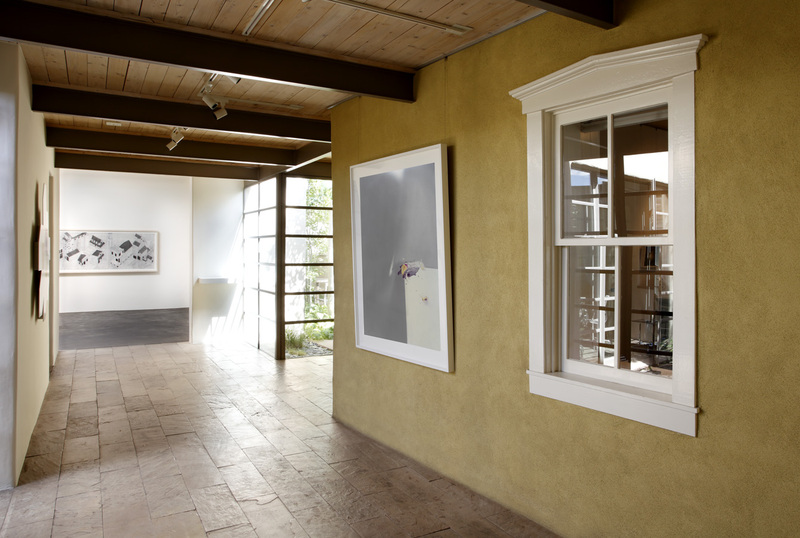 Like etchings, the images are richly detailed, and the shadow effect lends depth to create a sense of infinite space. 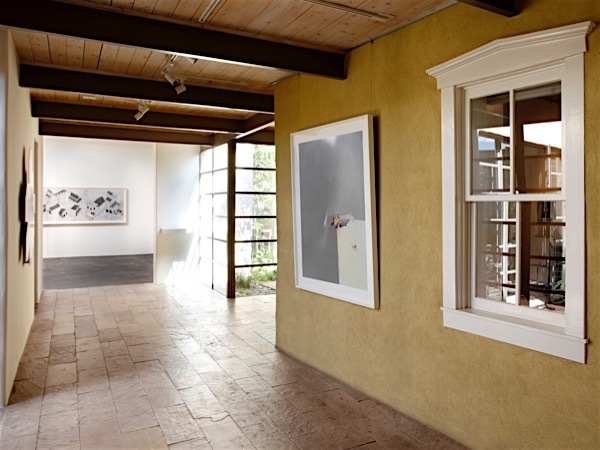 Trinity Site, in southern New Mexico, is the subject of a series of landscapes by Lefrak. She explains, “At first I was attracted to the historical narrative of the Trinity Site because . . . the resulting landscape after the atomic bomb was detonated is a kind of a physically ‘empty’ landscape yet completely not empty at the same time when considered within the context of our historical and current collective ideas of war.” Indeed, this landscape reveals little or nothing about the military-industrial complex that created it and has used it as a place of advancing weapons of mass destruction. In Trinity Site (2013) the only sign of humankind in the landscape is a barbed-wire fence. 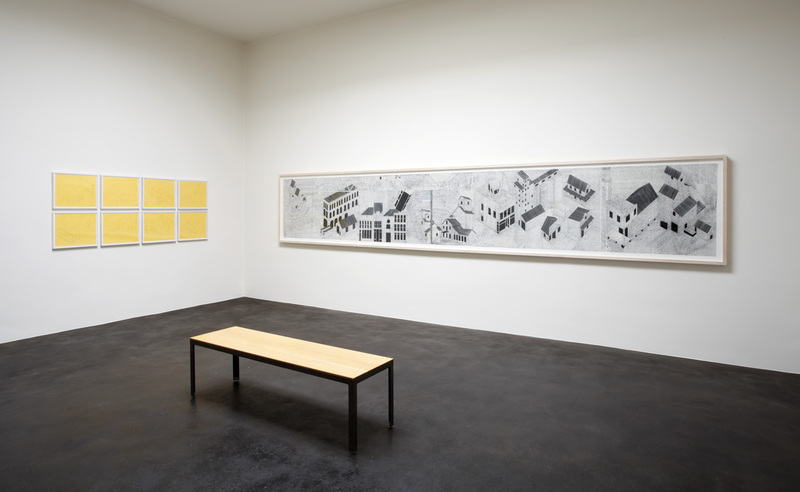 Image: Fred Sandback, Study of Installation—Galerie Heiner Friedrich, 1971, lithographs on yellow paper, 15 ½ x 19 inches each, Collection Lannan Foundation. Similarly delicate lines are seen in the work of Fred Sandback, whose minimalist sculptures outline planes and volumes in space by simply dissecting a room with colored yarn. With discreetly affixed ends, the yarn appears to come from within the wall or floor, stretching from one surface to another, creating the illusion of glass-like planes outlined in color. Like other artists in the minimalist movement, Sandback wanted to eschew symbolic references and recognizable imagery in his work and replace them with the here-and-now experience of moving through space. Describing the work, Sandback said that he left “discrete sculptural volumes for a sculpture which becomes less of a thing in itself, more of a diffuse interface between myself, my environment, and others peopling that environment, built of thin lines that left enough room to move through and around. Still sculpture, though less dense, with an ambivalence between exterior and interior. A drawing that is habitable.” All his “inhabitable drawings” originated as physical marks on paper in studies the artist produced. Presented in the exhibition are the artist’s imagined installations for German gallerist Heiner Friedrich in 1971 (not shown) and a 1989 design for the Dia Art Foundation in New York. Image: Siah Armajani, Fallujah model, 2004–2005, basswood, plastic, copper wire, and fabric, 19 ¼ x 16 x 16 inches, Collection Lannan Foundation. Iranian sculptor Siah Armajani has been living and making work in the United States for more than 50 years. Forced to leave his country in 1960 during the reign of Mohammad Reza Shah Pahlavi, Armajani subsequently made artwork based in architecture with themes inspired by literature, politics, war, and issues of social justice. 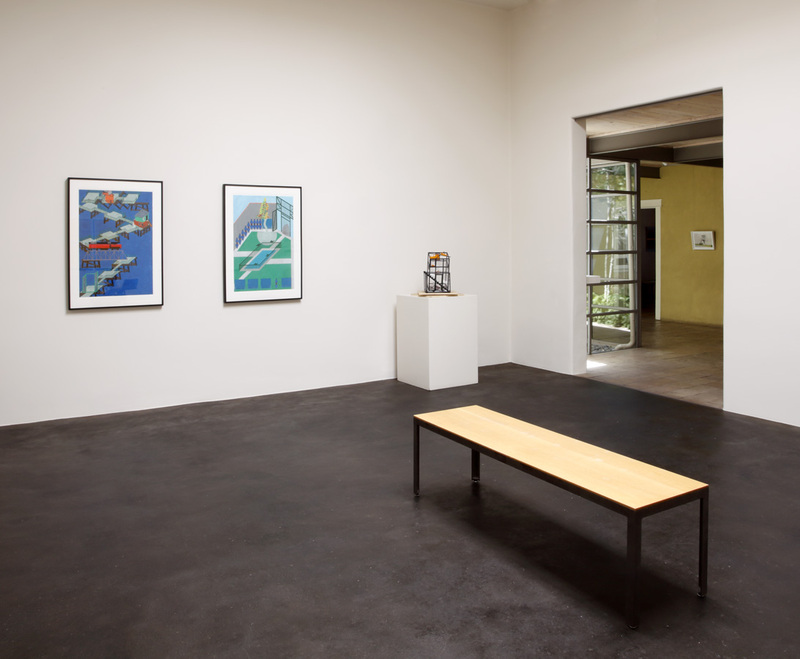 His projects have ranged from public sculptural commissions—such as the Gazebo for Two Anarchists at Storm King Art Center in Mountainville, New York, and Bridge for Iowa City at the University of Iowa—to smaller, more intimate works on paper. 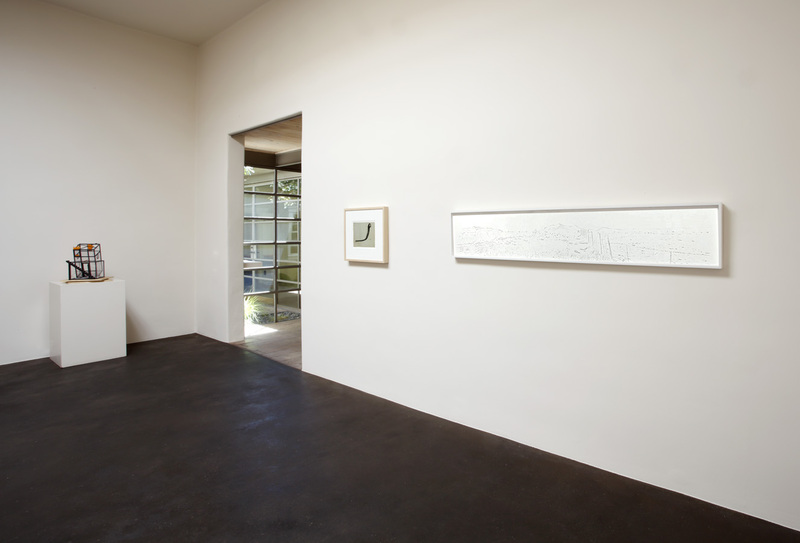 In 1996 Lannan commissioned The Poetry Garden for the courtyard of its Los Angeles museum; a drawing of the piece is included in this exhibition. Although much of his early work deals with utopian themes, often linked to American history, Armajani has more recently referred to his region of birth in the aftermath of the invasions of Afghanistan and Iraq. In 2007 the Foundation purchased one of Armajani’s most compelling works, Fallujah: a multilevel glass structure (measuring roughly 16 x 10 x 12 feet) created in homage to Pablo Picasso’s 1937 antiwar painting Guernica, which the artist compared to the death and destruction of the Iraq War. Lannan donated the monumental piece to the Walker Art Center in Minneapolis in 2011 but still possesses a version of the piece in model form. Throughout Armajani’s career, his goal has been to link different kinds of structures with their political, philosophical, and ethical implications. 36 x 222 inches, Collection Lannan Foundation. 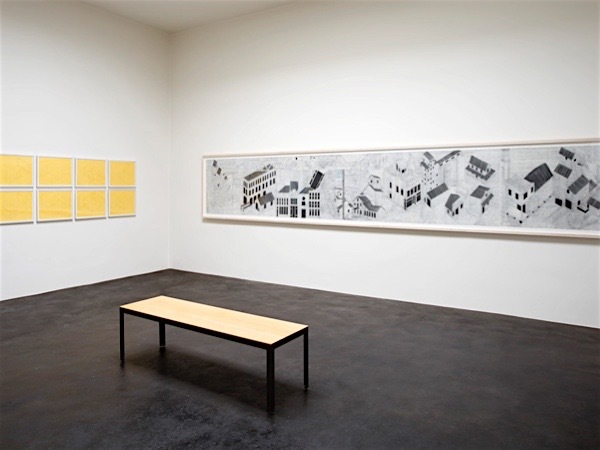 A centerpiece of the (Infra) Structure exhibition is Armajani’s epic drawing Written Minneapolis (The Last Tomb), 2014. This felt-pen-on-Mylar drawing measures 36 inches high by an impressive 222 inches long. In a love letter to both his hometown of Tehran and his adoptive home, Armajani portrays Minneapolis with its vernacular architecture and an air that is distinctly midwestern. Created on a specially made tilted work space in his studio, the scroll-like drawing is rich with shading and detail, all created using text written in the artist’s native Persian. 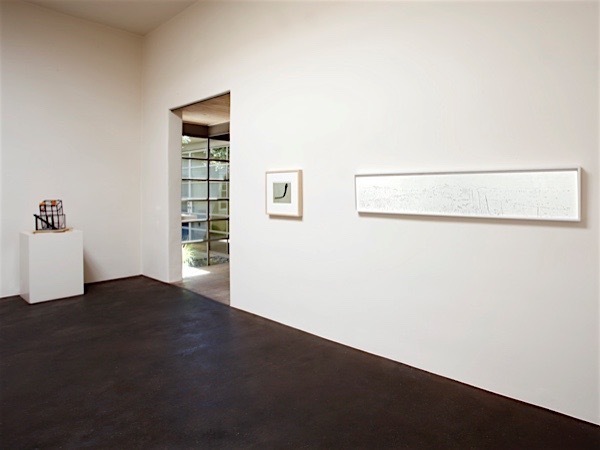 Among the works in this exhibition is Written Minneapolis (The Last Tomb), 2014. It is 18 feet long and a mix of writings and drawings of the neighborhood of my place of work. At the end of the nineteenth century and into the first two decades of the twentieth, this part of Minneapolis was developed to be used for warehouses and light industry. By now, the neighborhood has morphed from its early years of grain elevators into a mixed use of storage houses, residential, and crisscrossed with railroad tracks, some useful and some useless. Written Minneapolis (The Last Tomb) is a crooked memory of my childhood and adolescence in Tehran, and then later on after I came to Minneapolis. Empty spaces were filled with poetry that I had to memorize as a student . . . some Persian and some impromptu translations by my teacher of French symbolist poets. 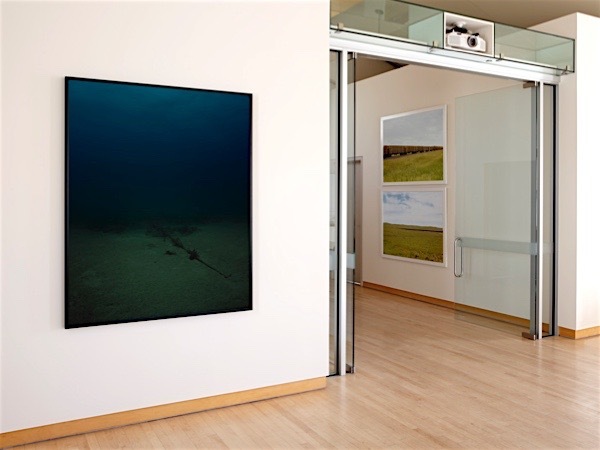 Image: Trevor Paglen, NSA-Tapped Fiber Optic Cable Landing Site, Morro Bay, California, United States, 2015, C-print and mixed media on navigational chart, C-print image 48 x 60 inches, map image 48 x 56 7/8 inches, Collection Lannan Foundation. 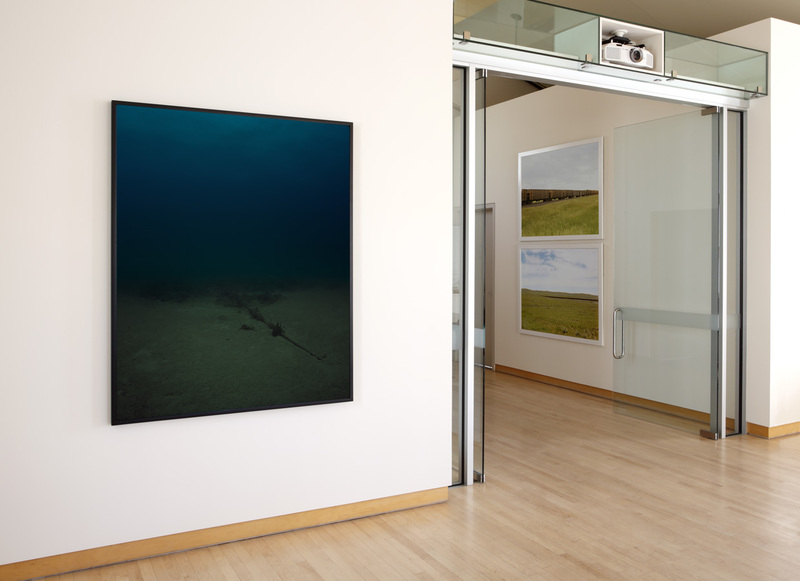 The work of photographer Trevor Paglen deliberately blurs the lines between science, contemporary art, journalism, and other disciplines to fashion painstaking and unknown research methods to decipher the world in which we live. 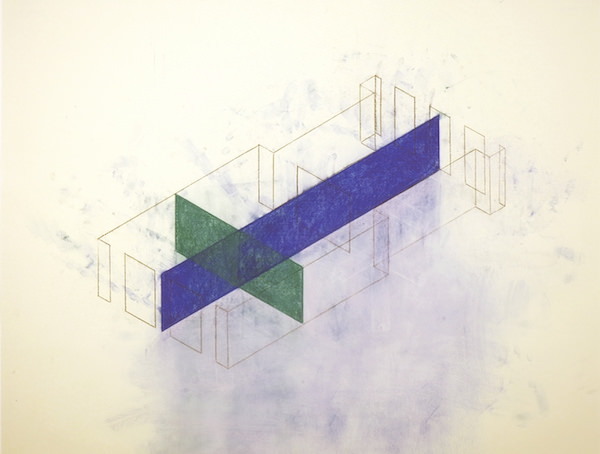 His subjects include experimental geography, state secrecy, military symbology, and visuality. The images presented in this exhibition are from the artist’s series on the geography and aesthetics of the National Security Agency’s global surveillance program. For this body of work, Paglen visited shoreline sites and underwater locales where the NSA has tapped transoceanic cables. Contrary to popular belief, personal communications and data are not transmitted in thin air via a “cloud.” Rather information is passed from one part of the globe to another via an intricate underwater cable system that the NSA monitors regularly at designated choke points. 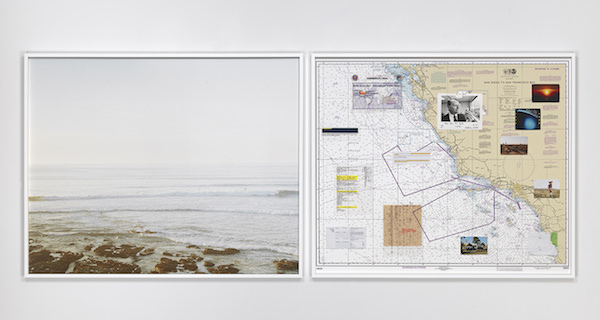 Coupled with collages of maritime maps and documents revealing their status as NSA surveilled locations (like this one at Morro Bay, California), Paglen’s banal seascapes reveal to the viewer just how little we know about what goes on below the surface. Learning to scuba dive, Paglen extended his work to the ocean floor, documenting the vulnerable and very much physical infrastructure that global communications depend on, such as this internet cable in the Bahamas. 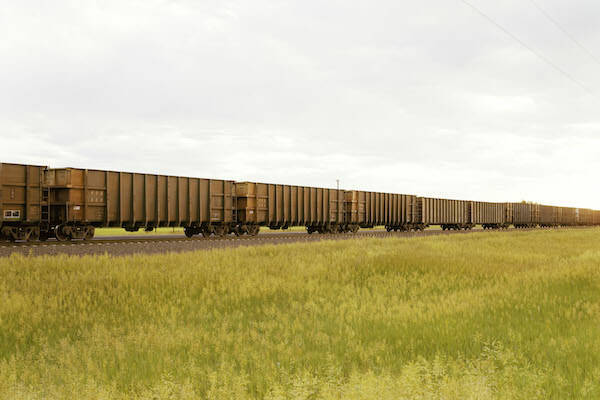 Image: Victoria Sambunaris,Untitled (Distant Train with Plains, Gillette, Wyoming), 2001, C-print, 39 x 55 inches, edition 1 of 5, Collection Lannan Foundation. Victoria Sambunaris has also documented American infrastructure, with trains and highways figuring prominently in her work. Nearly every year since 1999, Sambunaris has set out from her home in New York to cross the United States by car, alone, with her camera. In a piece for LightBox, TIME‘s photo blog, she explained her frame of mind when on the road: “Once I am rolling down the road, there’s a feeling of anticipation as I wonder about what lies ahead. The seemingly enormous inner turmoil over leaving New York is purged—a sort of ritualistic cleansing as I transition to the road. The monotony of the interstate, soon enough, becomes familiar and comforting once again. Driving it requires patience—looking and waiting—similar to the act of taking a picture. I watch the world pass across my windshield with time to think, look and listen. The Mississippi River has become a kind of first milestone for me; when I cross it, my state of mind shifts and the world slows down. In the car, I listen to the radio, the truckers on the CB or maybe some Led Zeppelin—a regular on my playlist. It keeps things lively.” Her photographs capture the expansive American landscape and the human-made and natural adaptations that intersect it, including trains in Texas and Wyoming, trucks in New Jersey and Wisconsin, the oil pipeline in Alaska, salt flats and mines in Utah, and images of the wall along the US–Mexico border. Combined, they present a sparse and vast landscape, dotted by human intervention, that is distinctly American. Sambunaris’s work in this exhibition celebrates the train, a symbol of western expansion for almost two centuries and a subject the artist has lovingly photographed and videotaped for more than 15 years. 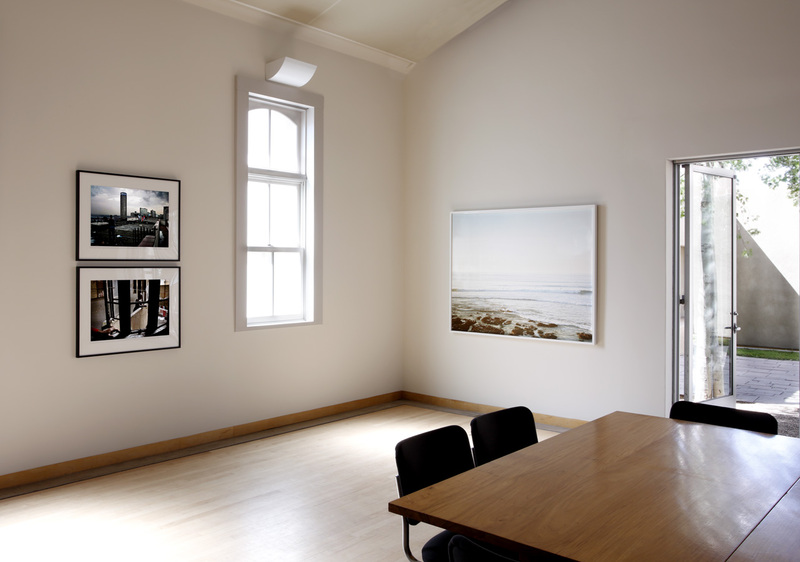 Image: Guy Tillim, Jo’burg: Al’s Tower, a Block of Flats on Harrow Road, Berea, Overlooking the Ponte Building, 2004, archival pigment ink on cotton paper, 19 ½ x 28 ¼ inches, edition 1 of 5, Collection Lannan Foundation. In direct contrast to the idealized or utopian cityscapes of Barbieri and Armajani are Guy Tillim‘s grave portraits of contemporary African cities. Born in South Africa, Tillim worked as a photojournalist for news agencies such as Reuters and Agence France-Presse for more than a decade before making the switch to fine art photography. Primarily working in sub-Saharan Africa, Tillim has created several bodies of work that examine the legacy of colonialism, especially as exhibited in architecture. For his series Jo’berg, Tillim roamed Johannesburg’s dense and decaying neighborhood of Hillbrow, an area dramatically affected by social and political changes during South Africa’s transition out of apartheid. Crowded, dirty, and seemingly uninhabitable, the old apartment buildings and crumbling skyscrapers in Tillim’s images reveal living conditions for contemporary Africans that are nearly apocalyptical. Initially a “white only” area, Hillbrow began in the 1970s to become home to waves of poor from the townships and to African immigrants from surrounding war-torn and economically challenged nations. Parts of Johannesburg, once considered the “New York of Africa,” are now the nation’s most dangerous and feared neighborhoods. In Tillim’s images, we see a startling portrait of modernism where the promise of concrete, steel, and glass has given away to a poverty, crime, and a broken social contract. Click on any image below to view larger. Use the arrows for previous-next.